We have added a new tool that will improve the live of team managers: 1on1 Planner. When you are reading the feedback provided by your team members you usually have ideas, mental notes or hints. You want a way to capture those notes to remember them in your next 1on1 meeting. Now you can do that inside Happy Mood Score. Along with each feedback message you will see an new icon located at the right. If you press that icon a new window will appear where you can add any notes that you want to remember. These notes will be available for you in the new 1on1 Planner link located in the main menu. You can access them, create new ones, filter by employee or mark them as done. You can add generic notes (not assigned to anybody) in case you want to remember yourself of something. 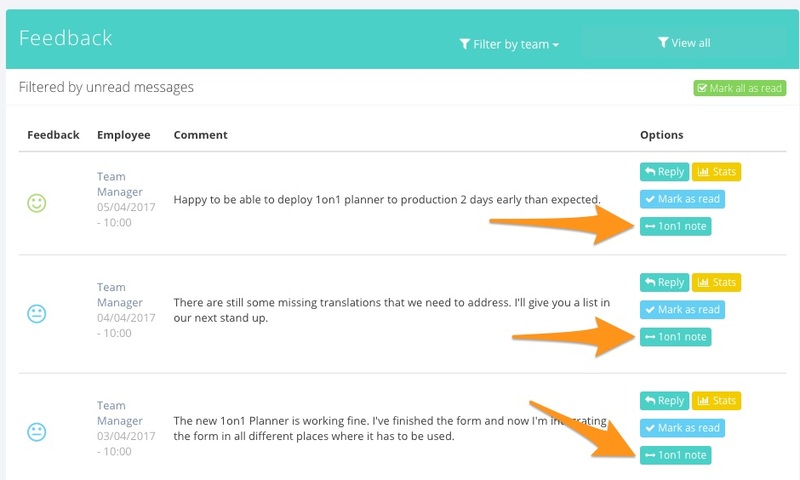 If you are not a team manager you can use this functionality to keep notes and ideas like a todo list. These notes are private and only the creator can see them. You can manage your notes via the API as well. If you have any suggestions to improve this planner, send us an email to info@happymoodscore.com with your ideas. Happy Mood Score is an employee feedback and engagement tool. Specially designed for companies with remote employees, digital nomads or distributed teams. Try it for free!